Breathe in the perfume of this 5-acre garden devoted to America’s most popular flower. More than 1,600 roses represent centuries of horticultural history. Significant collections of species, old garden and modern roses are arranged in theme gardens. Planted among the roses are beautiful companion plants, so there is something blooming in every season. Explore this tranquil Japanese-style garden that blends design elements from four classic garden styles. Cross an arched bridge and walk on shaded paths along a koi-filled stream to the teahouse, designed by architect Whitney Smith and built in 1966. The plants in this garden are all native to Asia, and include camellias, azaleas, mondo grass and Japanese maples. The distinctive roof of the teahouse, crafted from blue tiles imported from Japan, is especially striking in the spring when nearby pink cherry and plum trees are in bloom. The garden includes a minka, modeled after a traditional farmhouse, which was designed by Kenneth Masao Nishimoto and built in 1969. 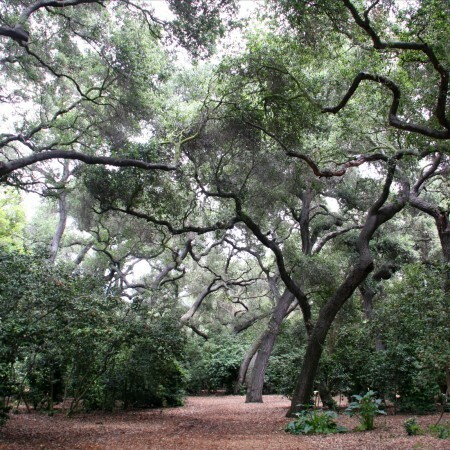 Before the area was opened to the public as Descanso Gardens, the land was an oak forest. In the late 1930s and 1940s, when newspaper publisher E. Manchester Boddy was building his estate called Rancho del Descanso, he planted thousands of camellias in the shade of the oaks to provide blossoms for the cut-flower industry. Those camellias, and others added in later years, continue to thrive. 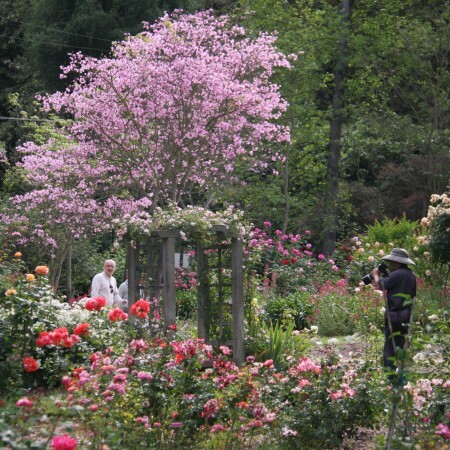 Today Descanso Gardens is home to North America’s largest camellia collection. 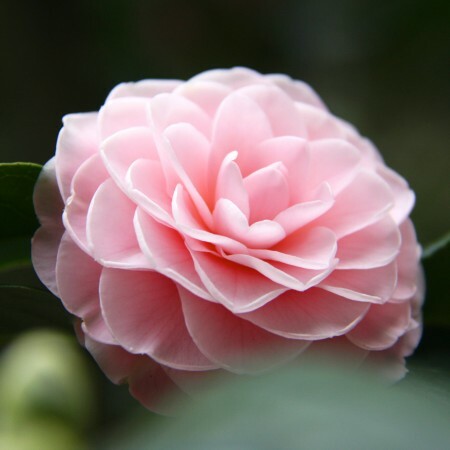 The Camellia Collection boasts rare and familiar camellias and has been designated an International Camellia Garden of Excellence by the International Camellia Society. Camellias at Descanso bloom from early autumn to spring, with the most dazzling floral display in winter, from January through February. Experience the giants in the Descanso landscape, the Coast live oaks (Quercus agrifolia). These trees, some centuries old, are the remainder of a forest that once blanketed the region. The Coast Live Oak typifies the natural Southern California coastal landscape. These trees are flowering plants and belong to the beech family (Fagacea). There are 19 species of Quercus native to California. The Coast Live Oak is an evergreen tree oak. Its natural distribution ranges from California’s Mendocino County along the Coast Ranges down to northern Baja California. The Coast Live Oak is known as a “keystone species,” meaning that the tree supports the existence of hundreds of other species, including mammals, birds, insects, fungi, plants, and even reptiles and amphibians. The Tongva people who made this region their home relied on acorns as an important food source. The importance of the Coast live oak in the interconnected web of life cannot be overstated. 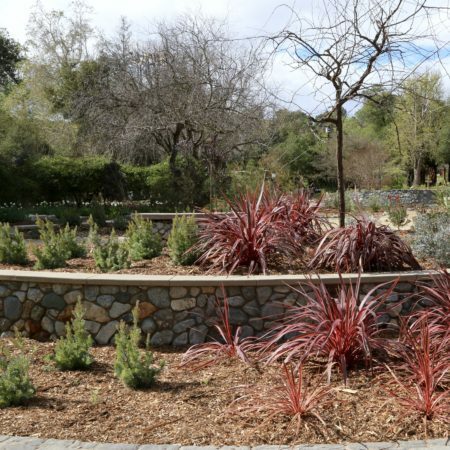 Descanso’s newest garden is centered on a collection of cycads donated by Katia and Frederick Elsea. The collection includes more than 180 plants representing 60 varieties including several endangered species. Virtually unchanged in form since the days of the dinosaurs, cycads provide a glimpse of the earliest types of flora on Earth. 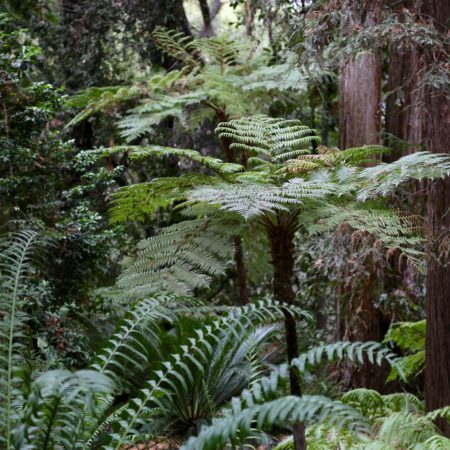 The collection is on view with other ancient plant species – including tree ferns, ginkgo and redwoods – in the Ancient Forest, which opened in September 2015. 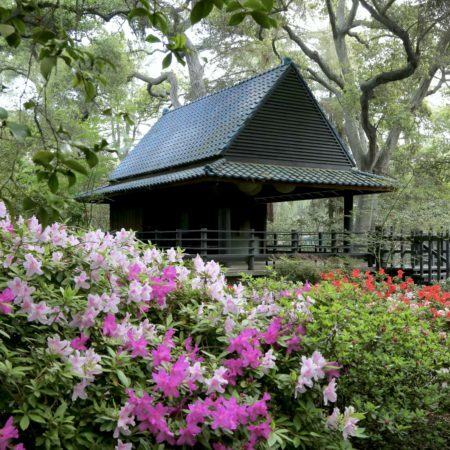 Opened in 1959, this 8-acre garden reflects the subtle beauty of the state’s native flora. 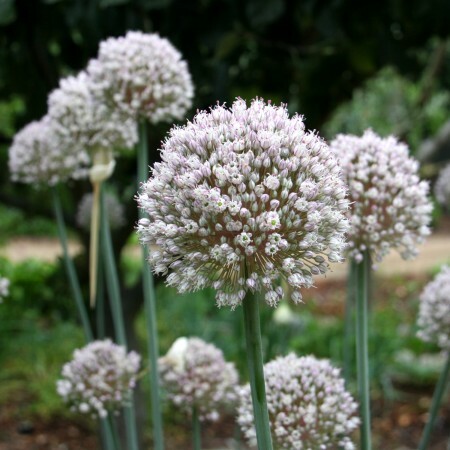 The California Natives Garden was designed by legendary nurseryman and native plant advocate Theodore Payne, who recognized the carefree beauty of landscapes cultivated with these climate-appropriate – and frequently aromatic – plants. Spring and summer is the best time to see bloom, including the sunny yellow flowers of the desert-dwelling palo verde tree, bright orange California poppies, deep blue ceanothus and creamy buckeye. 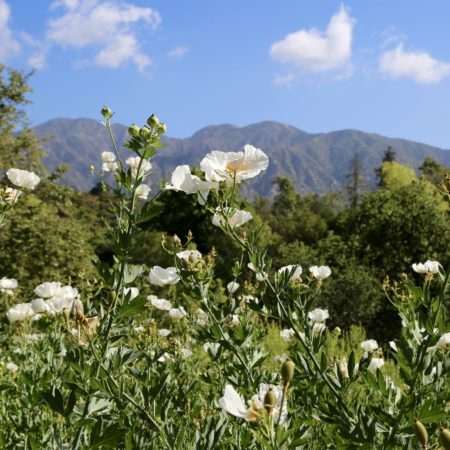 Early summer brings show-stopping Matilija poppies, with their dramatic “fried-egg” flowers topping lanky stalks. Monkey flowers, baby blue eyes, fairy duster – the names of these natives are as charming as the blossoms. In late summer and fall, the garden is mostly greens, grays and browns as plants go dormant to survive the hot, dry summers. Located just inside the garden gate, the Center Circle celebrates year-round color. The Gardens’ horticulture staff designed a new display featuring dramatic plants with flowers and foliage. This evergreen garden will be focusing on show-stopping plants in strong contrasts of silver, purple and hot pink from all over the world, which thrive in low seasonal rainfall. 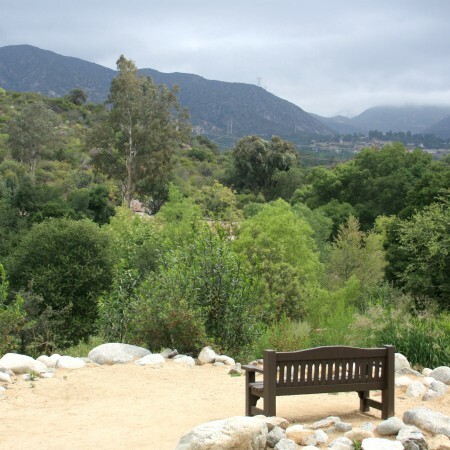 With its mix of woodland, meadow and chaparral plants, the Oak Woodland recreates the heritage landscape of the Los Angeles Basin – a plant community that included grasses, perennials, shrubs and, of course, oaks. An edible garden planted with fruit trees and seasonal vegetables along with herbs, edible flowers and other tasty accoutrements. The area is enveloped with vines, bushes, shrubs and greenery. Like the home garden, the bounty varies from season to season, including citrus, pomegranates, pumpkins and squash, herbs, greens, amaranth, corn — even apples! The design of Nature’s Table came with help from students enrolled at Cal Poly Pomona’s Landscape Architecture Design Studio who used the idea and space as a “real world” class project. Paths meander past planting beds filled with bright green produce. Arches, fences and trellises made from vines and fallen wood add a whimsical touch to this garden.